Spend 2-nights in a first class hotel in Singapore exploring the city. It is followed by a 17-day to Japan. In Ho Chi Minh, learn about Vietnam’s revolutionary history at the mythically named Dragon Wharf before venturing through the Cu Chi Tunnels in Phu My. After arriving in Hong Kong, take the cable car up to Ngong Ping village to visit the Tian Tan Buddha and Po Lin Monastery or indulge in Cantonese cuisine at the Tsim Sha Tsui. Then it’s off to Shanghai where the 16th-century Yu Garden will amaze you until you’re ready for some shopping on Nanjing Road. Once you arrive in Kobe, be sure to visit Arima Onsen, a hidden treasure known for its hot springs. Conclude your Asian adventure with a 2-night hotel stay in Tokyo, while enjoying the local sightseeing and local cuisine. Save Up To $200 Per Person & Receive Two FREE Perks! Meet your fellow travelers at the departure gate in Toronto airport for your flight to Singapore. Discover the rich heritage of Saigon and the Mekong Delta. You won’t forget your ride on a cycle rickshaw, known locally as xích lô (“sick-low”). Sit back as your driver whisks you past pagodas, colonial architecture and vibrant markets. A nice contrast to the city is the lush countryside of rice paddies and tiny villages along the Mekong. The freshness of the food is highlighted by the phenomenal fusion of local cuisine, a unique blend of Asian spices and French cooking styles. This former British colony brims with modern skyscrapers, ancient traditions and incredible food. A shopper’s paradise, local shops and markets offer everything imaginable, from silk to jewelry and electronics. 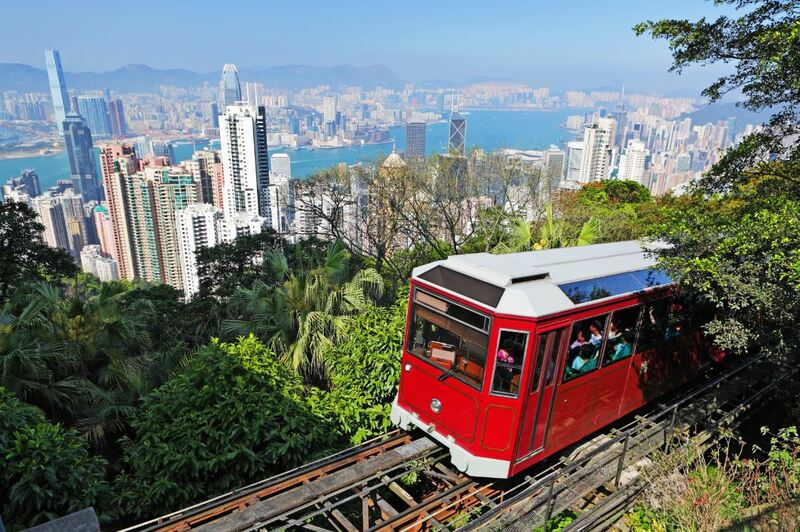 The highest point in the city, Victoria Peak, offers sweeping views of this vibrant city. Hollywood Road’s temple and antique shops are worth exploring, or take a junk cruise and explore the magnificent bay. As Asia’s culinary capital, your gastronomic desires are sure to be fulfilled. As China’s largest and most prosperous city, Shanghai is an international metropolis that draws travellers from around the world. Stroll past city sculptures along the Bund – a famous waterfront situated along the Huangpu River that’s nicknamed a “Museum of International Architecture” because of the impressive buildings lining the street. To view a classic Chinese garden in the city, the Yu Gardens are a must see. Shanghai’s bustling markets are ideal for browsing for a wide range of local goods. This fast-paced, ever-evolving city offers an abundance of attractions and activities and is continuously offering new ways to enjoy Shanghai. History is never far from mind in Hiroshima, thus the city has created one of the most important and breathtaking memorials in the world, the Hiroshima Peace Memorial Park and Museum. Statues, halls, and monuments at this World Heritage Site honour those who fell in World War II. As one of Japan’s largest islands, Hiroshima also offers rich natural beauty and a myriad of outdoor activities like biking, hiking and beaching. The local cuisine is plentiful, especially the signature “Okonomiyaki,” a crepe filled with meat, seafood, cabbage, and vegetables. Oysters (usually grilled) serve as an additional fresh and delicious culinary draw. Engage with locals and indulge in local flavours in this welcoming city, known for its famed dish Katsuo no tataki (a type of tuna Tataki). The city centre was initially settled in 1601 as a town surrounding Kochi Castle, which is now one of the region’s principal attractions. Delve into times gone by as you stroll along the famed, red Harimaya-bashi – the basis for an old local folklore song. Discover the lovely Katsurahama beach area, where the Sakamoto Ryoma Memorial overlooks the sea and honours this legendary Japanese peace negotiator. Situated between mountains and the sea, Kobe is Japan’s sixth-largest city and a port bustling with culture and fine cuisine. Named after its origin, famous Kobe beef is one of the delicacies to enjoy at the many gourmet restaurants. Don’t miss the chance to visit Ikuta Shrine – one of Japan’s oldest Shinto shrines – or tour a museum to learn about local culture. For sweeping views of the vibrant city, explore one of the nearby mountainsides through a diverse selection of activities. In the shadow of Mount Fuji, Shimizu is one of the most beautiful ports in Japan. Walk through the pine groves of Miho, home to a 650-year-old Japanese black pine, or enjoy spectacular views of Mount Fuji from the lush, forested hill of Nihondaira. Take in the seascapes on a bay cruise, or learn of undersea delights at Japan’s first sushi museum, and get a glimpse at feudal life in Japan in 200 BC at the archaeological site of Toro. Shop for traditional Japanese wooden handcrafts and fabrics unique to the region, and sample some yokan, a sweet jellied confection. 1 – FREE Unlimited Beverage Package. Ultimate Beverage Package prior to cruise in the amount of $23.80 per person per day. 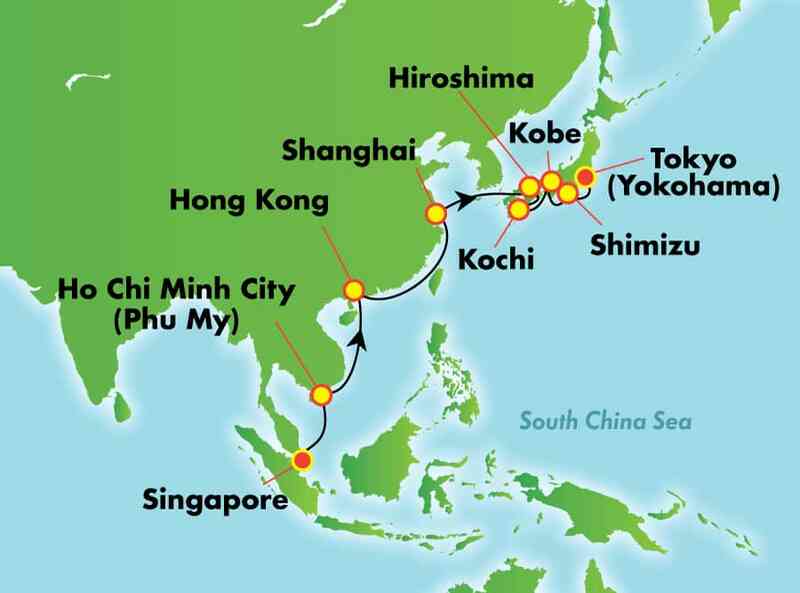 2 – FREE Shore Excursion Credit. $50 USD per port shore excursion credit is per stateroom. Credit has no monetary value and is non-refundable. ports. Use the credit or lose it. It does not include embarkation ports. Overnight stays count as one port. 3 – FREE Specialty Dining. on the retail value of the Specialty Dining Package prior to cruise in the amount of $22.80. Internet Package: 250 minutes is per stateroom. One login per stateroom, Internet package includes activation fee. BALCONY – Cat. BA $10,495 All above fares are subject to change without notice. Initial deposit of $1000 per person. Final payment is due by: DECEMBER 3, 2019. 2 Nights first class hotel stay in Singapore. 2 Nights first class hotel stay in Tokyo. Local sightseeing while in Singapore and Tokyo. 1 Lunch and 1 dinner while in Singapore. 2 Lunches and 1 dinner while in Tokyo. 17 Day cruise aboard Norwegian SPIRIT. Your shipboard gratuities on your cruise. All departure, port taxes/fees and surcharges. Please Note: Shore excursions are NOT included while on the cruise portion.